In Red Canyon, near 800-year old ruins called Palataki, you can ponder graphic marks created by people—over thousands of years. In the shaded alcoves you see a bear and several deities and a flute player in black charcoal lines above sheep, geometric patterns, and a coyote in earth-colored pigments with parallel incised marks behind pale collages of multi-colored zig-zags and painted shields. 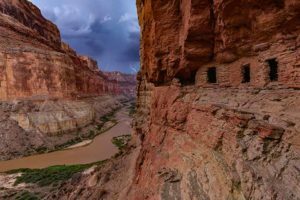 At least four distinct cultures—some separated by centuries and some overlapping—have left evidence of their passing through the natural sandstone canyons of Red Rock Country. Ornate charcoal signatures drawn in the late 1800s by some of Sedona’s first pioneers mark the beginning of the fourth and most recent culture to call this land home, but who came before? From Uptown Sedona, a thirty-minute drive heading west and then north, takes you to Red Canyon. The trip begins on a paved four-lane highway and then—as if going back in time—follows a dirt road, and finally trails. One trail leads to the east and takes you through fields, into an oak forest, and up to the picturesque, cliff-hugging ruins of Palatki. The other trail goes northwest, climbing switchbacks up to a series of adjacent alcoves with pictographs on the walls and ceilings. It is here, at Red Cliffs Rock Art Site one can see, first hand, the marks of those who came before. Carved and painted symbols cover the alcove walls communicating—without a written language—thoughts of people across untold centuries of time. Roaming thousands of years ago Archaic people gathered their food—walnuts, pine nuts, acorns, seeds, wild oats, mesquite beans, cactus fruit, wild grapes, and berries—as they wandered following the ripening seasons. The projectile point of a 10,000-year-old spear, made of chipped and flaked stone—evidence they hunted large ice-age animals right here in the Sedona area— was found near Loy Canyon. A palm-sized figurine made from a twisted and wrapped willow twig in the shape of a large mammal turned up in a cave in Sycamore Canyon. Hunting magic. Trance-induced shamanic visions reverberate from their incised patterns and faded pictographs. 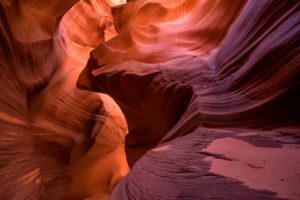 Ghost-like apparitions they painted with white kaolin clay pigment peer out from the alcoves of Red Canyon. 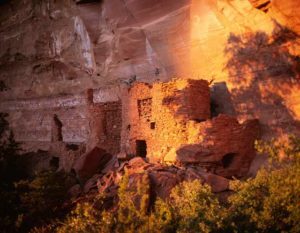 The name Palatki comes from the Hopi language and means “Red House.” Tucked under salmon-colored cliffs, the ancient pueblo—now a stabilized ruin—once stood two stories tall with seven rooms on the ground floor and more above. Constructed of local sandstone it has a noticeable reddish tone. Jesse Walter Fewkes, in 1895, was the first archeologist to examine Palatki. He estimated fifty to one hundred people—grandfathers and grandmothers, fathers, teenagers, mothers and babies, aunts, uncles, nephews and cousins—could have lived here at one time based on the number of rooms. The pueblo was begun, according to tree-ring dating, in A.D.1150 and was added on to over the next one hundred years. Walls were layed in, one course at a time, with large sandstone blocks mortared with hand-mixed mud. To provide support materials for doorways, windows, second story floors and ceilings, straight branches and trunks of juniper and pinyon were cut to size with stone axes. Walls, floors, and roofs were plastered smooth with more hand-mixed mud. Clan symbols were carefully painted on the cliff face above. Pictographs, drawn in white, tan, gray, and earthy red, show animals (zoomorphs), people (anthropomorphs), geometric shapes, patterns, and shields in the same alcoves the Archiac people marked. Then one day everything was left behind. The builders of Verde Valley’s large ancient stone villages—Tuzigoot, Montezuma Castle, Honanki, and Palatki—abandoned the area in the 13th century and wandered away. They moved from a fertile valley, temperate climate, and abundant water flowing in creeks and rivers. Eventually some of them settled on three isolated mesas seperated by drainages of the Little Colorado River. Here, they joined with the thriving stone villages of Oriabi and Walipi, begun by similar people to them many generation before. 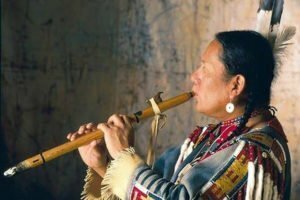 To this day, their descendants pass on traditional oral stories for the next generation to learn of their migration heritage to the Hopi mesas. Included in these is the story of a group’s journey from the mysterious land of red rocks to the south where the living was too easy. It was not until the 1930s that the culture that built Palatki was given the name Sinagua. In Spanish it means literally “without water.” Many Sinaguan sites have been given Hopi names—Wupatki (Wide House), Lomatki (Beautiful House), Wukoki (Tall House), and Honanki (Bear House)—to honor their history. Tuzigoot, located along the Verde River near the town of Cottonwood got its name from Apache workers helping excavate some of it’s one-hundred rooms. It means “crooked river” in their language. Montezumas Castle with its five-story tall classic cliff dwelling location is the most famous Sinagua site. It was most likely given its moniker by some romantically inclined—rather than historically accurate—chamber of commerce advocate. Dr. Harold S. Colton, founder of Flagstaff’s Museum of Northern Arizona, began scientifically piecing together the Sinagua story in the 1930s. The name he adapted—Sinagua—came from the 16th Century Spanish explorers who christened Arizona’s 12,000-foot mountain Sierra de Sin Agua (Mountain Without Water). No rivers or streams run down from the mountain, the water goes underground instead, only to reappear in springs and seeps. Most of the painted images (pictographs) and carved or pecked symbols (petroglyphs) were usually made by the Sinagua. 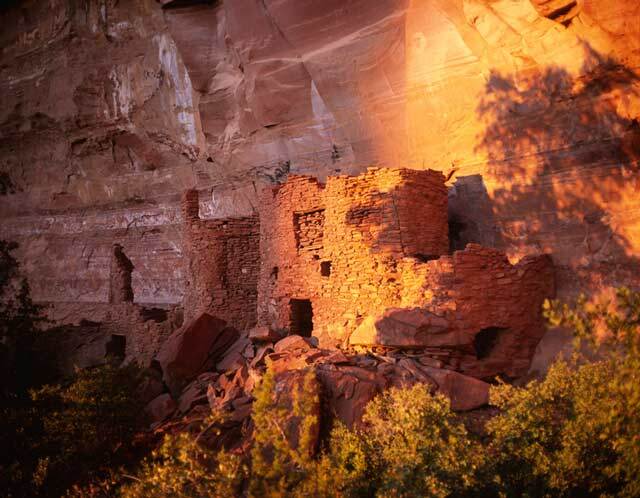 They lived throughout the canyons of the Sedona area from A.D. 700 until around 1450. An interesting trait of their rock art is that glyphs found in the eastern parts of Red Rock Country are pictographs while the glyphs found in the western side are petroglyphs. More recent drawings in charcoal and pasty mud were made by the Yavapai who have lived in the Verde Valley since the 1500s. The once separate Yavapai and Apache were sent out of the area in the winter of 1875 by the troops of General George Crook under orders of the U.S. Army. Kept at the San Carlos Reservation in east-central Arizona they weren’t allowed to return to the Verde Valley until the 1890s. Twenty years later they were grouped together as the Yavapai-Apache and given an official reservation. Our desire to interpret the various symbols can be misleading. No one really knows what they mean except those who made them. The possibilities are intriguing: clan symbols, hunting magic, warnings, decorations, family records, maps to water. Our 21st century culture based mostly on Capitalism and Christian beliefs has a hard time understanding cultures of the past that were based on hunting, gathering, and shamanism. Archeologists can be more certain of what can be measured. For instance Boynton Canyon has over sixty Sinagua ruins sites. They can tell the exact year many were built by taking a core sample, about as thick as a pencil, from any remaining roof beams or door lentils. These core samples show the individual growth rings of the tree up to the year it was cut down to be used for building material. The stripes on the core sample are wider on wet years when the tree grew more and thinner on dry years. These patterns are then matched to a master chart of growth rings, spanning hundreds of years, for trees growing in the southwest. Pottery is another useful method of understanding ancient sites. With the many different styles of decoration and techniques of construction, archaeologists can map out where the pottery came from if it wasn’t made locally to see who was trading with whom. Until recently local archeologists were stumped by the abundance of a crude grayware pottery type originating from the other side of Mingus Mountain near the Prescott area. The shards weren’t nicely decorated and weren’t very well made. But they kept showing up in ancient site after ancient site. Finally technology become available to analyze microscopic remnants adhering to the clay shards. This gave them scientific evidence as to what the vessels once contained. Researchers smiled when it was discovered that what the ancients were eagerly trading for was a beer-like beverage. The ancient people had an intimate knowledge of the landscape. They observed the angles of the sun, the length of the days, the phases of the moon. 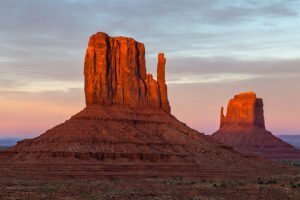 Sedona experiences average overnight temperatures hovering near freezing for the months of December through February and daytime highs can reach over one-hundred degrees in June, July and August. It couldn’t have been easy for these people, but they made it work for them. Most of their dwellings are in south-facing alcoves with overhanging cliffs. The overhang easily provided a natural roof protecting their homes from deterioration by rain and snow. In the hot days of summer, when the sun arcs high in the sky, the alcove would provide cool shade. The south-facing orientation utilized solar heating and thermal mass, from the low-angled sun, to warm them in the winter. On your way back to town as you begin to think about where to go for dinner, try to imagine preparing an evening meal from what grows along side the road. On a lucky year, perhaps every half dozen or so, the pinyon trees might bear a harvestable crop of pine nuts. If its late summer perhaps you can collect enough cactus fruits to hold your appetite overnight. If your aim is good with the bow, you can bring home a rabbit or mule deer for stew. And for a special treat come springtime, try harvesting and roasting an agave. Hopefully your small field of Indian corn will produce enough this year to store through winter. And as long as someone will make the corn flour with the grinding stone, dinner shouldn’t be too far away. Before I leave for home, I face east and think of spring, of sunrise and beginnings, and of creation. I then face south, and think of summer, of warmth, and of ease. As I face west, I think of autumn, of sunset and endings, and of completion. I turn to face north, and I think of winter, of cold and of strength. I look upward, and think of the heavens, of the infinite, and of the ethereal and spiritual. I look down, I think of the Earth, of the finite, and of being grounded to the physical world. And, finally, as I draw my attention inward, I sense all the directions meeting in my center, a conduit of the heavens and the Earth, and of balance.